In 2010, we conducted a public-facing study about the future of books and reading, called Reading Ahead. We raised many fascinating questions including the design implications for the digital book experience: which elements of the traditional experience should move forward and which should be left behind. Some functions of physical books that seem to have no digital place are nevertheless being retained. An author’s autograph on a cherished title looked as if it would become a relic. But Apple just applied for a patent to embed autographs in electronic titles. Publishers still commission covers for e-books even though their function — to catch the roving eye in a crowded store — no longer exists. While we “delivered” our project’s results in an earlier post, in our client engagements we often have the experience of revisiting the same material for another audience. We might deliver a 3-hour interactive presentation with our core team, and then come back weeks later and share the highlights with their management team. And while we might panic at compressing the 3 hours into (say) one hour, it’s a really powerful editing activity when forced to do that. What is the core of the story? What do people need to know about? What have we learned in giving the presentation already? What has changed since then? For Reading Ahead, we’ve been sharing this work with friends at Adobe, Blurb, UC Berkeley, and the Savannah College of Art and Design. And that’s given us a chance to revisit the presentation. We’ve refreshed it visually, focused the core message, and expanded it to include some things that came out since our initial research was conducted (i.e., Amazon’s advertising campaign for the Kindle and the launch of the Nook). We haven’t recorded a new narration (check out the full deliverable if you want that), but you can see how we’ve focused our story in this presentation. Our work is about understanding and acting, so our engagements typically include workshops where we facilitate client teams in using our research findings to generate concepts and start prioritizing ideas for further development. For our self-funded Reading Ahead project, we had no client, so we took this action step by partnering with Industrial Design Supersite Core77 to put our research findings out to the global design community as the basis for a 1-Hour Design Challenge. We worked with the Core77 team to review all the contest submissions received over the last month, and today are pleased to announce the contest winners. 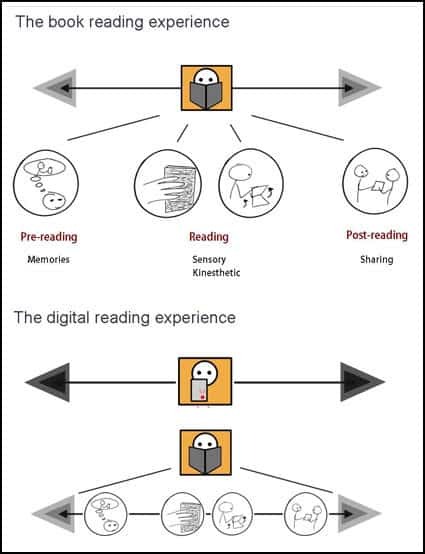 The latest 1 Hour Design Challenge, The Future of Digital Reading was based on Portigal Consulting’s Reading Ahead initiative-recent research around books, reading, behavior, and technology. There was great interest in this competition-it’s a hot topic these days of course, with introductions of new e-readers and a constant stream of “end-of-print” articles-and we had tremendous participation from design schools, individuals, and professional design firms. The research provided for this design challenge was infused with stories about real people, so entries that referenced people and their habits were the most successful. Indeed, entries that embraced story-telling as a way to get their concepts across were much more compelling than those which simply presented a comprehensive list of features. (Yes, we get that the future is OLED displays!) It was daunting to see the number of submissions that were essentially a Kindle with feature statements that did away with the acknowledged limitations, so entries that ran the other way had a good chance of standing out. Still, there was great design thinking here, and a ton of design innovation here, and we were thrilled to see people (and teams) digging deep into the research and trying to refract it through the lens of artifact and experience. This 1 Hour Design Challenge was a tough one to jury, but here (in suspenseful order…the Winner’s at the end) are the judges’ selections and comments. Congratulations to the Winner and Notables, and thanks to everyone who participated! 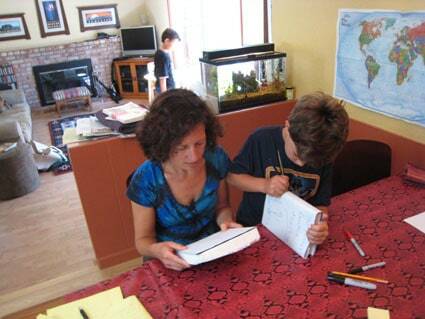 Portigal Consulting and Core77 will each be donating $300, in the name of the prize winner, to 826 Valencia (a nonprofit that helps kids with expository and creative writing, and San Francisco’s only independent pirate supply store). 826 Valencia will put together a celebratory gift bag (i.e., pirate booty!) to honor the winner. 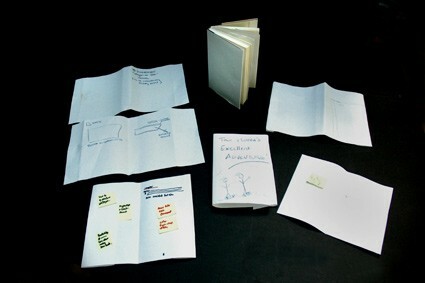 The PaperBack provided several nice design solutions in one package. We were charmed with the notion of displaying the cover of the book on the back side of the device for others to see (of course, we’d expect a “hide cover” option in the preferences! 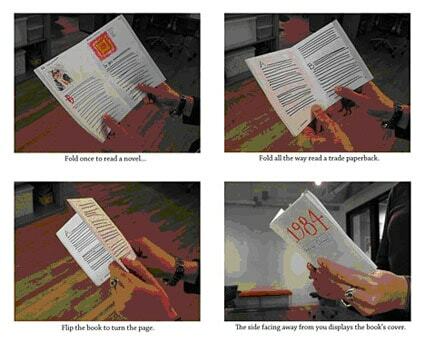 ), and the flip-the-book-over action to turn the page is something we liked from a couple of the entries. The user’s ability to customize the form factor to modify the book-from paperback to novel-was a great start, but we felt that it perhaps didn’t go far enough. Maybe combining this with the next Notable entry, “The Page,” would make for the killer concept. It was irresistible to conflate “The PaperBack” device above with this concept, taking the form factor all the way to a newspaper-scale object. And self-supporting no less! The Page embraces some of the graphic conventions we’ve grown to love (in this case The New York Times) but then brings some live navigation and hand gestures into the mix. 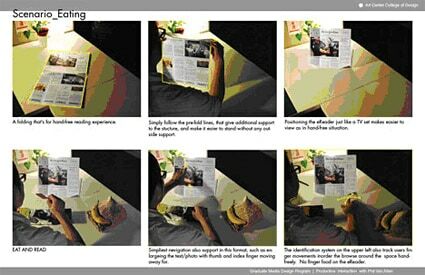 The photographs make for a compelling presentation, and again, made us dream about a device that folds all the way from a paperback out to a newspaper. Utopian? You bet. 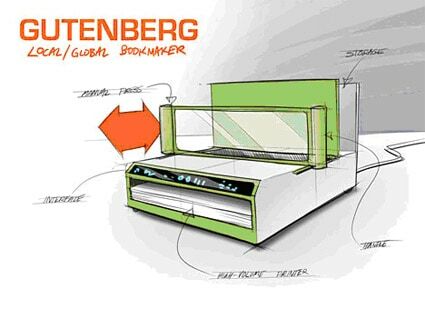 Cameron’s Gutenberg Local/Global Bookmaker considered a novel solution (pun intended): at-home book-making. Companies like Blurb have sprung up to address this as a service, but could print-on-demand happen in the home? 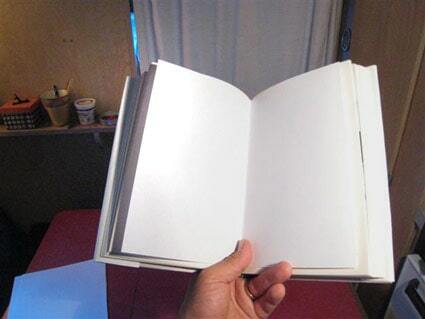 We have the technology to print paper, but we don’t have the ability to make actual books. 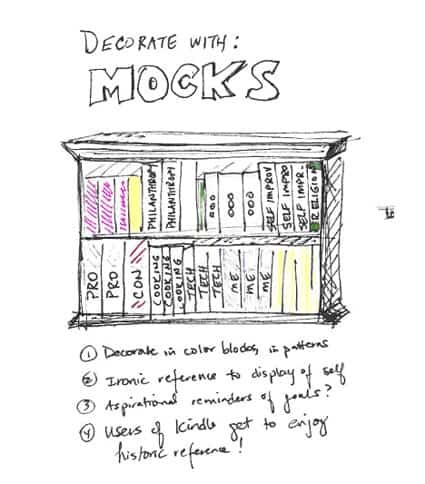 Provocative, with a sweet rendering, this entry made us think about revisiting a low-tech artifact rather than running immediately to an e-reader device. While the thrust of Jdouble’s flipit is (gulp) a Kindle with a different (and better UI), the brilliant innovation was the Tamagotchi-like feature: As the user reads more, the device gives positive feedback (in this case, a facial expression). 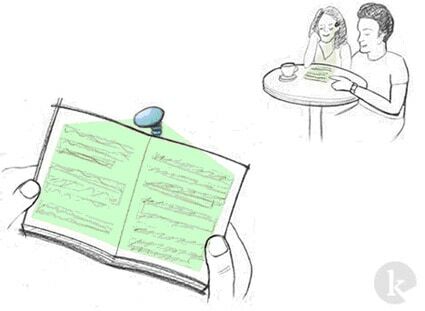 The design research identified how social the act of reading can truly be, so it was a nice touch that the designer considered how the device itself could participate in the social behavior (a theory that is well supported by the work by Nass and Reeves at Stanford). Kicker’s Booklight rethinks where the digital data is. 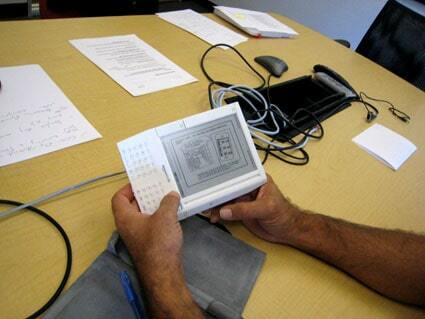 The classic solution for an e-book is that the data resides inside the device and comes to us up through a screen. 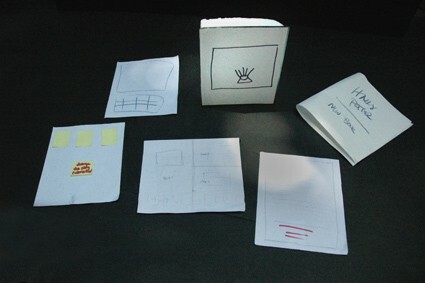 The Booklight form factor, in contrast, is an embodiment of their rethinking: the content is projected down onto any blank book, decoupling the content from the presentation of the content. The Booklight lets the user select the size, heft, and feel of the surface they want to read on, giving back the tactility of the bound book many have grown to love. We were also amused to note that Kicker, known for phrases like “Tap is the New Click,” didn’t fall into the touchscreen swipe-to-turn-the-page interaction ubiquitous in the other submissions. Such restraint! Stacey Greenebaum’s Mocks doesn’t try to solve everything; it takes one piece of the ecosystem and offers a provocative solution. People need to display their identity through their books, but as books move from atoms to bits, why not have a product that simply displays book titles in the home? The question of whether those titles represent actual or aspirational reading strips the identity issue down to its core: in that social moment at least, it’s not about the content. And, we have a winner! 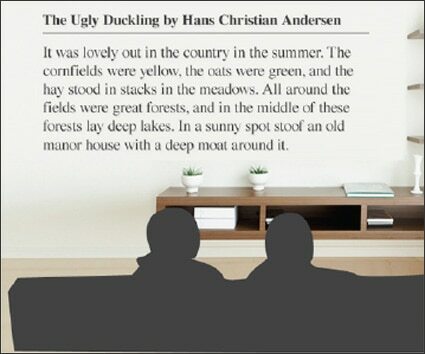 Hot Studio and Friends, with their concept for shared living room reading, takes the grand prize. There was a serious case of kitchen-sinkism on this (massive entry), but perhaps this was understandable given the large team they convened for the effort. While life in the living room is increasingly fragmented across devices, and media content keeps upping the hyper in order to grab some fraction of our attention span, Hot has a big idea a la Slow Food: bringing reading back into the media room so people can spend time together…with books. 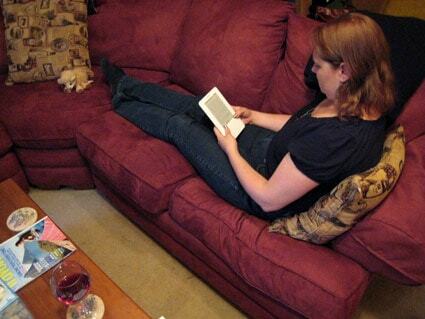 This concept reconsiders the entire reading gesture, going from hand-held/one foot away, to hands-free/10 feet away. 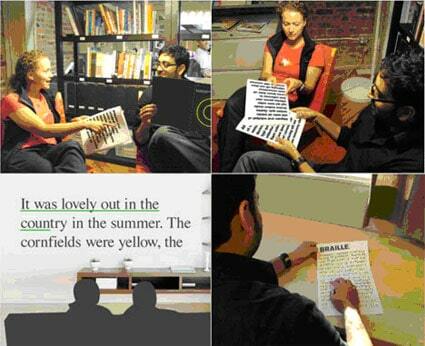 Research participants told us that they saw books as a respite from their over-connected, screen-based lifestyles; here’s an application of those digital technologies that has the potential to engage people with reading in a new way. The team also deserves special mention for the quality of their effort. 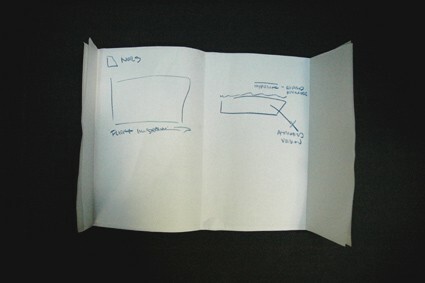 They illustrate their solutions in a variety of ways, showing the power of quick-and-dirty paper and Photoshop prototyping. In bringing people together to create and inspire each other, they’ve generated a best-in-class artifact that reveals great process, uses scenarios based on research participants, and a demonstration of how humor can help sell an idea. Hot Studio modeled how it really should be done. Kudos! Last week we presented Reading Ahead at the UC Berkeley Design Futures speaker series. Since we conducted this study without an external client, this was our first time sitting down with a group of people and talking about what we found and what the opportunities are. In most client situations we’ll meet people from across departments within the same organizations; here we met people who represented many different aspects of the book industry, from antiquarian booksellers, to experts in the digital reader space. Since our emphasis had been on the consumer side, this exposure to the diversity of the producer side was really enlightening, and the result was a really provocative discussion. Thanks, Liz, for the opportunity. We look forward to the next opportunity we have to share this work with a live audience! We’ve been hard at work synthesizing the Reading Ahead data. 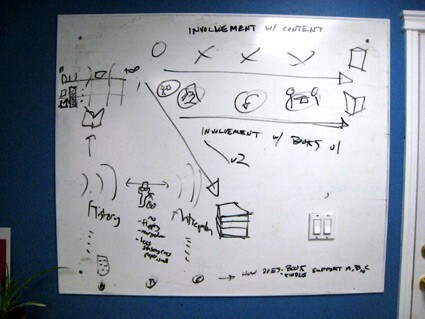 There’s a great deal of writing involved in communicating the results, and sometimes it makes sense to develop a visual model that represents a key idea. 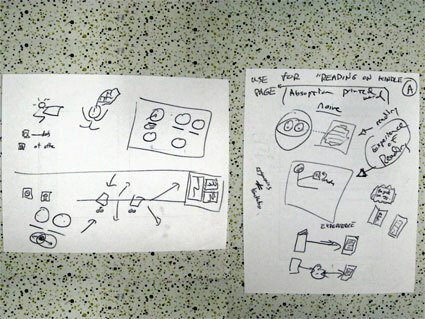 Here are several partial models evolving through paper and whiteboard sketches, and finally into digital form. We’ll be finishing synthesis soon, and publishing our findings on Slideshare, with an audio commentary. There’s always something new in every project. Often we encounter a bit of process that we may not know how to best manage it. So we’ll make our best plan and see what happens. We learn as we go and ultimately have a better way for dealing with it next time. In a regular client project, we write a screener and work with a recruiting company who finds potential research participants, screens them, and schedules them. Every day they email us an updated spreadsheet (or as they call it “grid”) with responses to screener questions, scheduled times, locations, and contact info. It still ends up requiring a significant amount of project management effort on our end, because questions will arise, schedules will shift, people will cancel, client travel must be arranged, etc. etc. For Reading Ahead, we did all of the recruiting ourselves. Although we’ve done this before, this may be the first time since the rise of social media: we put the word out on LinkedIn, Twitter, Facebook, email to friends, and here on All This ChittahChattah. Being split across the two of us and these different media, eventually we were interacting with people for whom we had to check our notes to trace back how we had connected to them, which was great for our sample, since it meant we weren’t seeing a group of people we already knew. It was further complicated when we had finished our fieldwork and wanted to go back to everyone who offered help close the loop with them, thanking them for help. Technically, and protocol-wise, it took some work (who are the people we need to follow up with? Who follows up with them? What media do they use), basically going through each instance one-by one. We haven’t figured out what we’ll do next time; we won’t forget the challenges we’ve had but there’s just not time or need right now to plan for the future. If I had to guess, I’d imagine a Google Spreadsheet that includes where we got people from, who owns the contact, whether they are participant-candidate or referrer, etc.). Despite being very pessimistic about the demands of recruiting, we still underestimated the time and complexity required for this project. 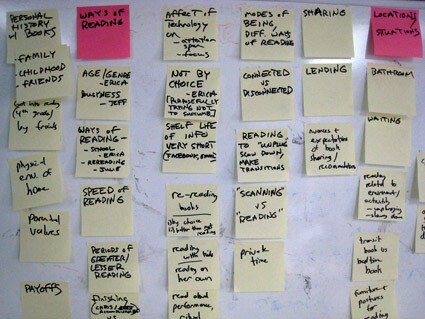 I started today by typing up all of the Post-it notes you saw in our recent blog post on Synthesis. This activity created a 6-page Word document of bullet points. The next part of the process is something I always find challenging: taking an incredibly detailed list of observations, particpant statements, hypotheses, and ideas; figuring out what the Big Ideas are (there’s a point in the process where many of them seem Big! ), and putting those into a form that tells a cogent story. First step: make a cup of tea. Then I went into PowerPoint, which is what we use when we present findings to our clients. I’ll continue bouncing back and forth between Word and PowerPoint; each piece of software supports a different way of thinking and writing. 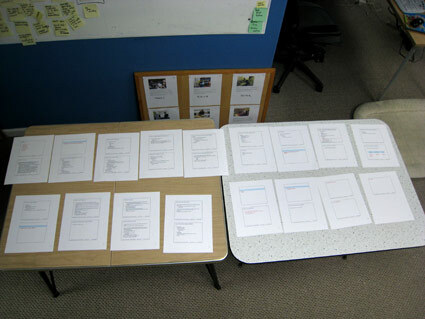 I printed out the presentation draft, and laid it out so I could see the whole thing at once. Steve came back from a meeting and I asked him to read over what I’d printed out. He started writing notes on my printouts, pulling out what he saw as the biggest of the Big Ideas. We talked about what he’d written, which led to an energetic discussion in which we really started to breathe life into this. Tomorrow, I’ll start the day by iterating the presentation draft based on our conversation. Here’s some more articles, projects, websites, and other online ephemera that we’ve come across since we posted part 1. The book as a form factor has been around for about 2,000 years, since Julius Caesar first decided to fold up a scroll, accordion-style, and mark the pages for later reference. In 1455, Aldus Manutius was the first to publish the portable paperback, and it has remained relatively unchanged since. XPLANE Founder and Chairman Dave Gray explores several questions about the future of the book and the web browser. 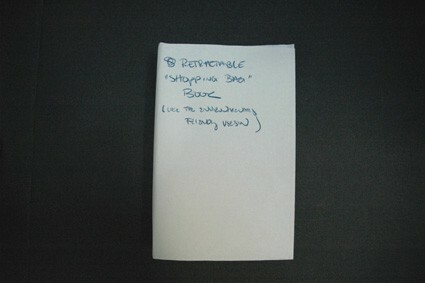 a sub-$300 touch-screen “Reader Touch Edition” and the $199 “Reader Pocket Edition,” which features a 5-inch display. The company is also lowering prices of ebooks. New releases and best-sellers will all be $9.99, matching Amazon’s price point for the first time. NPR Science Friday broadcast exploring Who Owns Your Digital Data? Lynn, you cover books and publishing for NPR, so do you have a Kindle or an e-book Reader? LYNN NEARY: Actually, I don’t, Linda. In fact, my cubical at NPR and my night table at home are loaded down with good, old-fashioned books because even though I’ve actually seen the Kindle work and I’ve talked to a lot of people who love it, I still can’t imagine reading some of my favorite novels on the Kindle. What about you? WERTHEIMER: I love it. It’s especially nice for traveling. I really do not leave home without it. But I did have a very peculiar experience with Kindle. I was reading a book and all of a sudden, I was back at the beginning of the book. So I thought I’d punched some button somehow. But no, what I had was a book in two pieces. 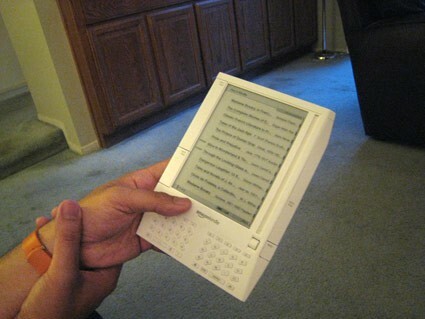 Some 40% of North Americans who responded to a Forrester Research survey in Q2 2009 had heard of, but had never seen, an e-reader. Another 17% had never heard of one. But ownership more than doubled year-over-year to 1.5%. Where there are bookshelves, there will be books! The Diamond Age is a postcyberpunk novel by Neal Stephenson. The Primer in The Diamond Age is a complex and highly elaborate descendant of today’s hypertext. Unlike the very static version we are familiar with today, the Primer is fully interactive. It not only offers the reader an open-ended narrative, but it also changes to the reader’s demands, among many other features. Vogon Heavy Industries is proud to make the The Hitch-Hiker’s Guide to the Galaxy available to Earth Internet users under licence from Megadodo Publications, Ursa Minor. Synthesizing field data into well-articulated, data-driven patterns, themes, and opportunities is a big part of our work, but it’s an aspect that generally has less visibility than the fieldwork. An essential early step in the synthesis process involves going back over the fieldwork sessions. An hour or two-hour interview creates an incredible amount of information. 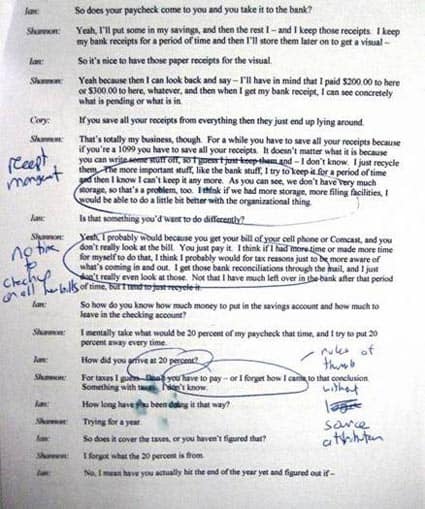 By going back into a record of the interview, we make sure not to leave anything significant behind. 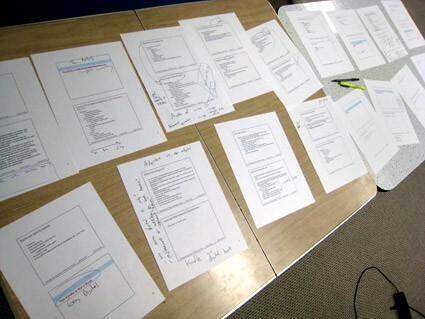 We go through and make notes on interview transcripts (done by an outside service), watch videos of the sessions, and look over photographs, sketches, maps, and participatory design pieces. We made a bulletin board of the people we met, so they’re ever-present while we’re working. Yesterday we came together to share the points we’d each pulled out. We present each interview, like a case study, to the team. Sometimes it’s just us, and sometimes our clients join us for part of this process. While one of us presented, the other captured the essence onto Post-its. We had a lot of discussion and debate while we did this, pulling together multiple viewpoints. Our next step is to take these notes and start grouping them. We’ll look at different ways the information can be organized, and from there, will start refining our work and writing it up clearly and succinctly into a report. 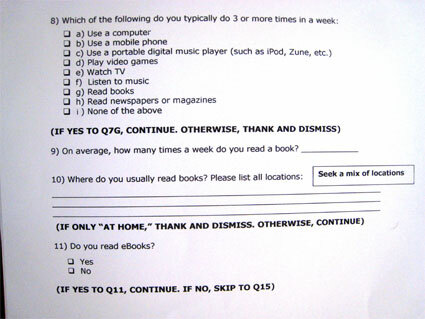 In addition to our in-person fieldwork, we often ask research participants to do some kind of task on their own. In past projects, these assignments have included a range of activities, from workbooks and journals with specific daily prompts, to fairly open-ended photo diaries. For Reading Ahead, we asked people to do a short photo diary, and send us five or so digital pictures (before the interview session) that would help us get a sense of how reading fits into their lives. Diaries like this accomplish several things. They give us access to a person’s world beyond what we might be able to get in just a face-to-face meeting. We’re able to see what they do in more locations, at more different times, and in more situations. We probably won’t be there to see someone actually reading in bed before they go to sleep at night, but they might well ask a family member to take a picture of it for their photo diary, as Tracy did for this project. Diaries also help us build rapport more quickly with the people we’re meeting, by giving us a common set of stories to begin the conversation with. There’s often a bit of back and forth dialogue between us and the participants during the assignment as well, which helps us establish a relationship. Having some shared knowledge and possibly interaction prior to the interview means that when we are face-to-face, we can jump right in with that person at a deeper level, which can free up time in the interview session for exploring more areas of the research topic. When you look at the pictures people sent us for this project, you’ll see that they’ve responded in a variety of ways. Some focused on objects, some took pictures of other people, and some photographed themselves or had other people photograph them. It’s useful to see the different ways people interpret the topic area, and the connections they draw. It helps us understand how each person sees the world, and can point us to additional lines of inquiry. Below are the photo diaries for Reading Ahead. Our fieldwork sessions often include a piece in which we ask participants to brainstorm and fantasize about the future. In an earlier post, we talked about the simple models we were building for the Reading Ahead interviews. Often for us, the very act of making the props for an activity suggests new ways of using them. In this case, while making a blank cover for the “future book” model, we realized that we could also make a blank inner page spread. As it turned out, this meant that when we were done with the sessions, people had created very nice book models for us, with a cover and inner spread. 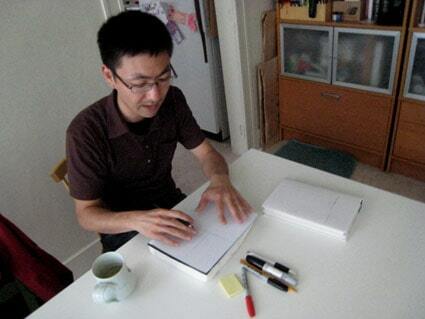 Part of the preparation for each interview session was to get the models ready with new blank paper. 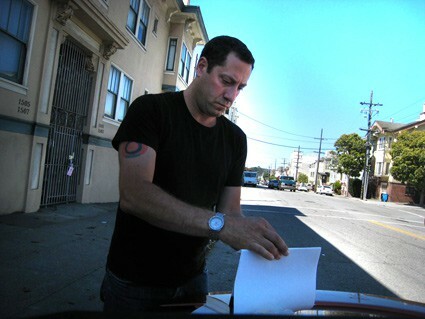 Here I am on the trunk of my car, prepping the models before an interview in San Francisco. Now that the fieldwork is done, we have a great collection of models made by the people we interviewed. The last section (copied below) of our Topline Summary synthesizes some of what we gleaned from this part of the fieldwork. These are just quick hits; we’ll develop any themes and recommendations that come out of these activities much further in the analysis and synthesis phase of the project. Books that contain hyperlinks, electronic annotations, multimedia, etc. As soon as possible after concluding fieldwork, we write a Topline Summary, in which we capture our first impressions and the ideas that are top-of-mind from being in the field. We’re always careful to be clear about what the Topline is and isn’t. There’s synthesis that happens from the fieldwork experience itself (which the Topline captures), and synthesis that happens from working with the data (which we haven’t done yet). In the Topline we go a step further than the field highlights and start to articulate some of the patterns we think are emerging, but these ideas may change once we do a detailed analysis and synthesis of the data we’ve gathered. 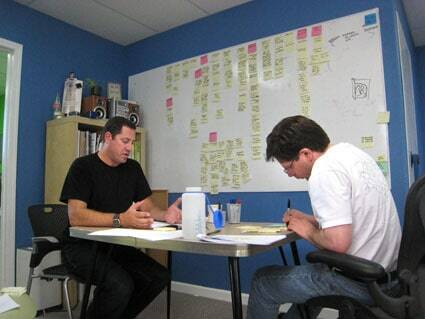 In a client project, we’ll have a discussion with the client team around the Topline Summary. We encourage members of the client team to come out in the field with us, and the Topline discussion is a great opportunity for everyone who did so to share their experiences and tell stories. The Topline discussion is also a good time for our clients to let us know if there are any specific directions they want us to pursue as we analyze and synthesize the data we’ve gathered. We’ve now finished our fieldwork for Reading Ahead. We conducted six in-depth interviews, with photo diary and participatory design activities (more in our next few posts about these methods). 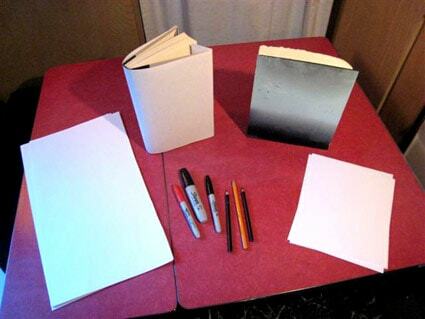 People can use a book together: parents and kids, showing someone a passage or illustrations, etc. Childhood memories, passing books between generations, reading with one’s own children. Quality of paper, printing, etc. Erica organizes her books by how the content/type of book feels to her: “dusty” classics, modern classics, etc. Julie has a history of wanting to read on electronic devices as well as from printed books, so to her, the Kindle is a big evolutionary step from her old Palm, the iPhone, etc. Books afford ways of navigating content that the Kindle does not: flipping, comparing non-sequential pages, looking at the recipes at the end of each chapter, etc. During the fieldwork cycle, we write quick summaries of each interview session and send these immediately to our clients so they can start to circulate stories. At this point in the process we strive to stay descriptive; our goal is just to get stories about the people we’re meeting out to the extended team (us, our direct clients, and their stakeholders). Our interview with Julie (not her real name) was the last session in the fieldwork for this project. 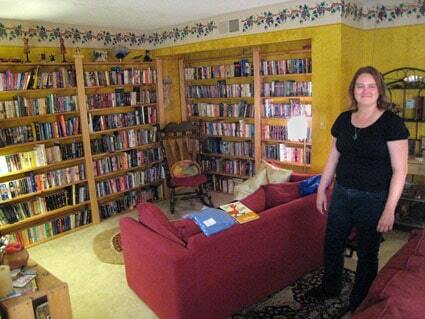 Julie and her housemate have an amazing library in their San Leandro home, with three walls of alphabetized floor-to-ceiling bookshelves. With the bookshelves and quiet ambiance of the space, being in this part of their home feels just like being a library. The whole downstairs of their house has been optimized for reading; they have great lighting, and comfortable sofas big enough for two people to stretch out on simultaneously. Of the six people we met, Julie was the person who most seemed to have integrated printed book and Kindle reading. For Julie, reading a book and reading on the Kindle are both equally positive experiences; in fact, she will sometimes go back and forth between a printed book and the Kindle version of the same book, depending on whether she is at home, traveling, etc. While some of the people we met described the Kindle as less-than-satisfying compared to a printed book, Julie has a long history of reading on electronic devices, and finds the Kindle a big step forward. Jeff (not his real name) is in the midst of a big remodeling project at home so we met with him in his Silicon Valley office. He was the second Kindle user we saw in our fieldwork, and had a lot of positive things to say about reading on the device. Jeff says that he’s not a “flipper” but does tend to be reading 3-4 books at a time, as well as newspapers and blogs. These various pieces of content require differing levels of attention and serve different moods, and Jeff likes that on the Kindle he can have all of this material at his fingertips, especially when he’s doing a lot of traveling. Jeff uses his Kindle for not only for personal reading but for work as well, and sometimes publishes documents he needs to read to the Kindle. 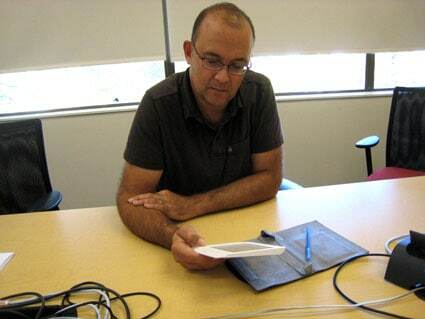 He and his team have also experimented with using the Kindle as a platform for delivering presentations. Jeff says one of the things he feels Amazon has done really well is to develop the “device ecosystem.” Between his job, the remodel, and a household that includes 4 kids and several dogs, cats, and chickens, Jeff is extremely busy, and he likes the ease and efficiency of the book-buying experience the Kindle supports. 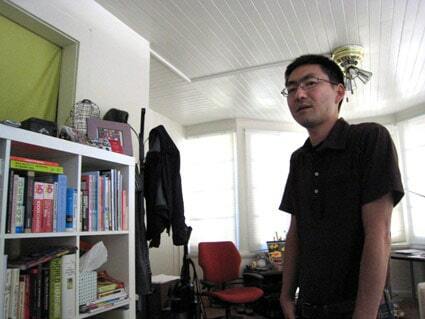 Chris (not his real name) is a software engineer in his early thirties. 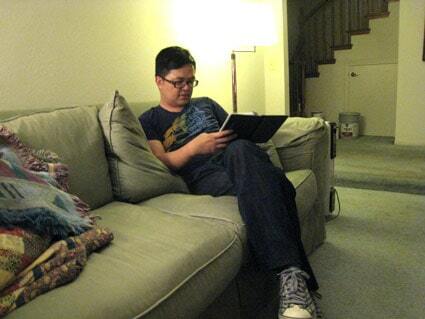 He lives in an apartment in Mountain View with his wife and their small dog. They moved here a couple of months ago, after returning from an extended stay in Europe. When they left the US for Europe, the couple got rid of many of their possessions, including their books. Now that they’ve settled in again, Chris says he’s still trying to keep from accumulating too much stuff, and has been buying fewer books and using the library more. Chris says he used to focus more than he does now on finishing books as a form of accomplishment. He described how he used to line up the books he had finished in a row, so he could see a physical record of his reading. 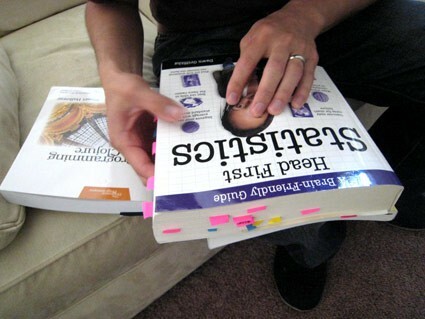 Chris reads a lot of technical books. Since he uses many of these as reference materials, often annotating and bookmarking them, he generally finds it useful to own them in print, rather than borrowing them from the library or using PDF versions. Chris showed us the various ways he navigates through printed books, including “flipping” and going back and forth between non-sequential pages. We met with him at his home in Vallejo. He describes doing several types of reading: instructional reading to expand his knowledge about topics of interest like photography, fiction as a “form of engagement with a piece of art,” and non-fiction as a way to vicariously experience other places and lifestyles. Peter’s had his Kindle for a couple of years. He says when he first got it (as a gift from his partner), it “got him” buying books right away, and he used it almost exclusively for around a year. He says serious limitations of the Kindle are that you can’t have two books open at once (if you’re using a reference book, etc. ), that it is unable to “capture” the act of flipping through a book looking for a passage, and that it still doesn’t create the same quality of experience as “the whiteness of paper” and crisp black text. The biggest frustration for Peter is that he can’t share Kindle books. Erica (not her real name) is 28 and lives by herself in an apartment in San Francisco. She described growing up without a lot of money but in a house where there were “walls of bookshelves.” When she and her Mom had free days, they would visit different libraries, and Erica still remembers physical details from some of these places. She had been planning to open a cookbook store, until the recent economic slump. She’s working now as an office manager at a software startup and regrouping. She says that lately she’s really been noticing how “the computer lifestyle has seeped in so deeply,” which she feels is making her attention span shorter. She says that on the computer, “everything is fast,” and that books are a way to “unplug” and slow down. Erica has different types of books for different weather, moods, and reading situations. On public transit, she reads books that can be easily stopped and started; something she says is difficult to do with complex works. Here is the first of these highlights for Reading Ahead. We met with Tracy (not her real name) and her two sons at their home in a suburb of Santa Cruz. Tracy is a stay-at-home mom and part-time massage therapist, and is going back to school in the fall to get an MA in Occupational Therapy. Reading is a big part of her family’s life. She reads every night with her sons (including a two-hour Harry Potter session the night before), and told us she does different voices for each character in the stories. 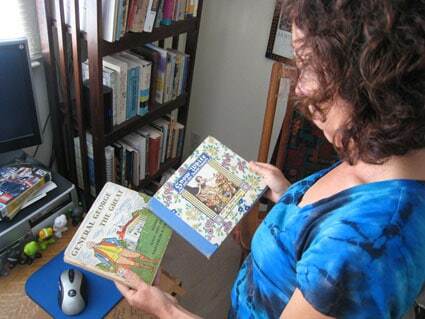 Reading has always been important to Tracy, and she showed us several books from her own childhood that she keeps on her shelves–including one that her father had when he was a child. She also talked about sharing book recommendations with her Mom and her friends. 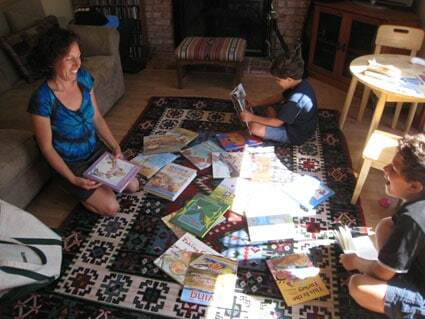 Tracy and her boys make a weekly trip to the library, which usually culminates in a big spread of books on the living room floor. I asked them to show us what this is like. Watching the boys comb through the pile to choose a book, I was struck by how physical their interaction with the books was. There was also an interesting family moment where I asked about a book Tracy mentioned (Tacky, a children’s story about an iconoclastic penguin), and all three spontaneously recited the names of Tacky’s friends in perfect unison. 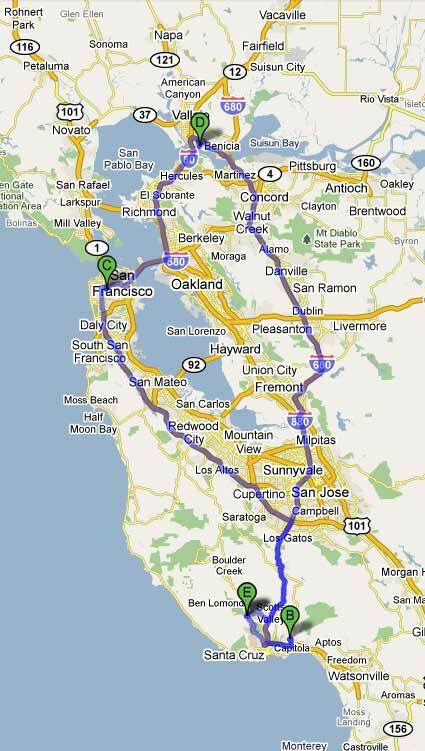 Here’s what my day looks like today–3 interview sessions starting this morning in Soquel, then up to San Francisco, and then over to Vallejo where I’ll finish up around 9 pm. I’ve tried to schedule everything so I’ll have time in between each interview to write notes. It’s amazing how hectic what seems like an ample schedule often becomes once you factor in traffic, parking, eating, checking email, and the general miscellany of a day. 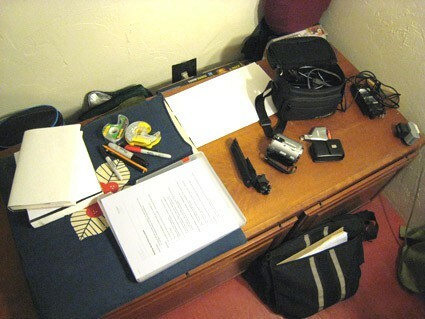 I got everything ready last night: video camera, still camera, release forms, models and materials for participatory design activities at the end of the interview session. I went over the interview guide, and am feeling really good about it. I always get kind of charged up when I run the interview through in my mind the night before fieldwork starts. There’s this unique feeling that comes from knowing that I’m about to go out and find out things from people that, sitting at my desk the night before I go, I can’t even imagine. Figuring out how to identify appropriate people to interview for a project is all-important. For Reading Ahead, we know we need people who are active readers. What constitutes an “active reader?” We’re defining it as people who read books at least three times a week, in multiple locations. We want people who are engaged in the behavior at a level where they will have lots of experiences from which to draw. 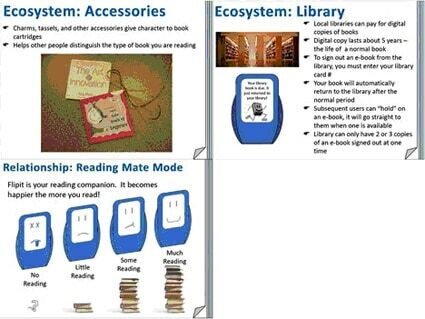 We also know that we want to look at how people’s behavior changes/doesn’t change/is supported by/is influenced when reading books in print vs. reading eBooks using a device. When we have established the criteria for participating in the research, we typically use a specialized recruiting company to find people. We write a screener, which has a series of specific questions to identify people who meet our criteria. Finding the right people can be quite complex, and for some projects, we’ve written screeners that are more than 10 pages long. If we’re looking for people who do activities X and Y, in locations 1, 2, and 3, but have never done activity Z-well, you get the idea! In this project, the criteria are simpler, and we’ll be doing our own recruiting. In fact, if you’re in the Bay Area and an avid reader or Kindle user, let us know and maybe we can talk with you! Update: We put together a representative screener that is formal enough to be given to a recruiting firm, even though we aren’t doing that for Reading Ahead. You can download it here. We’re very excited here at Portigal Consulting to announce the start of a new self-funded project–Reading Ahead. In Reading Ahead, we’ll be exploring the evolution of reading and books from a consumer perspective–what it means to be a reader, how artifacts from traditional books to devices like Amazon’s Kindle affect the experience, and what the future might hold for readers, product developers, and beyond. Over the course of the project, we’ll be blogging both about how we work and what we see and learn. 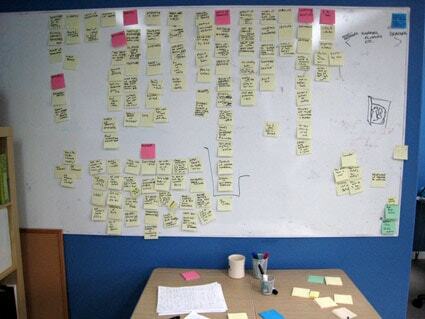 One of the first steps in any project is figuring out what the project is really about. 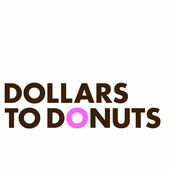 So the first piece of research we do is often focused on our client. As we work with our clients to establish the scope and approach of a project, we also interview key stakeholders in their organization to better understand what they know and what they need to know. (This doesn’t always map to what they think they know and what they think they need to know, and it’s important to suss out the differences.) 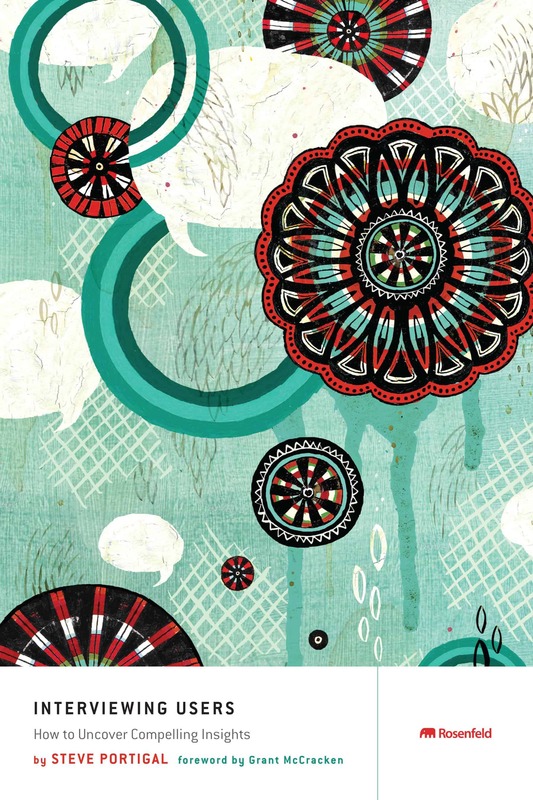 These interviews help us understand the dynamics of the team and the organizational culture. What is it we want to know that we don’t know now? What are we going to do with what we learn? What are the people, places, things, behaviors, etc. that we think we want to focus on. How broadly or tightly do we want to draw the scope of the exploration (at least at the outset-this can change as the project moves forward). In this case, to what extent might we want to be looking at bigger categories like content, entertainment, free time? The way we answer these project definition questions will have a huge affect on how the work unfolds. As in most projects, we’ll be looking for the sweet spot that is constrained enough to give the project a clear focus but open enough to leave room for the unexpected.